A self-signed certificate is a certificate that is signed by the person creating it rather than a trusted certificate authority. Self-signed certificates can enable the same level of encryption as a $1500 certificate signed by a trusted authority, but there are two major drawbacks: a visitor's connection could be hijacked allowing an attacker view all the data sent (thus defeating the purpose of encrypting the connection) and the certificate cannot be revoked like a trusted certificate can. We're going to explain when a self-signed certificate should and shouldn't be used and then share tutorials on how to generate a self-signed certificate for common platforms like Microsoft IIS, Apache, and Java Keytool. Self-signed certificates or certificates issued by a private CAs are not appropriate for use with the general public. An Intranet. When clients only have to go through a local Intranet to get to the server, there is virtually no chance of a man-in-the-middle attack. A development server. There is no need to spend extra cash buying a trusted certificate when you are just developing or testing an application. Personal sites with few visitors. If you have a small personal site that transfers non-critical information, there is very little incentive for someone to attack the connections. Just keep in mind that visitors will see a warning in their browsers (like the one below) when connecting to a server that uses a self-signed certificate until it is permanently stored in their certificate store. If you are going to use a self-signed certificate for one of the situations where they are appropriate, it is much better to create your own private CA certificate. This is a more secure option that allows you to avoid warnings like the one displayed above for doing just a little bit more work. 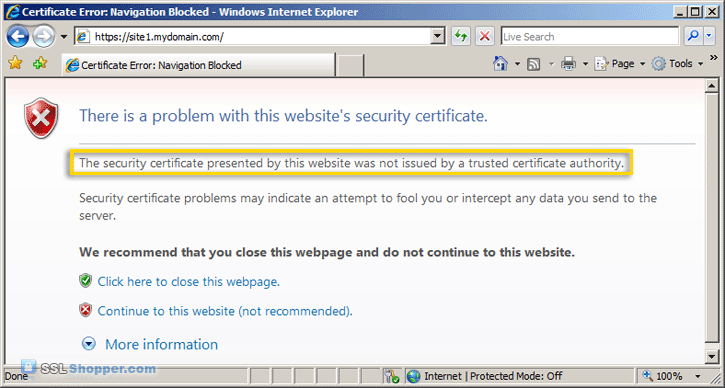 Creating a self-signed certificate in IIS 7 is much easier to do than in previous versions of IIS. IIS now provides a simple interface for generating a self-signed certificate. One drawback, is that the common name of the certificate is always the server name instead of the site name. In order to change the common name, you'll need to follow some additional steps. Creating a self-signed certificate to secure an Apache site requires the use of OpenSSL. This gives you full control over how the certificate is created. Generating a self-signed certificate with Java Keytool is (usually) the simplest of all the platforms, though you don't get quite as much control as using OpenSSL.